I Left My Heart In Rye. Yes folks I really did. Specifically in the comfiest bed I’ve ever had the pleasure to sleep in at The George In Rye. 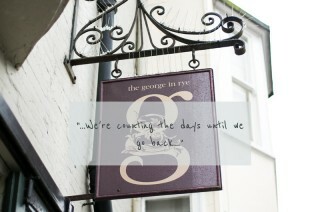 Ste and I were invited to stay there a few weeks back to experience… well The George In Rye experience. And I’m not just referring to the all those glorious happenings that transpire when a wedding takes place at the venue but to the wider ‘George‘ experience too. From a visit to the wonderful Rye Retreat (more on that in a bit) to Rye harbour where we hung out with the bikers by the boats and back to the bar at The George for some lip-smacking cocktails, this place has it all. All log fires, contemporary British inspired interiors but yet cosy at the same time, The George do weddings (obviously) but the hotel and restaurant are open at all other times too, so if you fancy a romantic weekend away then it’s definitely worth making the trip to soak up the sunshine and sea breezes. Often called London-by-the-sea, Rye itself is a chocolate box of a town, perched on a hill-top about two miles away from the windswept beaches of Camber Sands. I’ve wanted to visit Rye for what seems like forever, ever since my parents returned from a relaxing weekend away and declared that I had to sample its wares for myself. It’s filled to bursting with with antique and vintage boutiques that wouldn’t look out of place in the South of France, chi chi bars and gorgeous restaurants. We arrived to blazing sunshine and the bluest skies which when paired with the white sandy beach just down the road, the boats docked in Rye Harbour and the pervading coastal vibes made me giddy at the thought of how immense your wedding portraits could be here. Back way back when before the boy and I were even engaged, I dreamed of hosting my wedding at The George In Rye. My parents had bought back glossy pamphlets showing The Georgian Ballroom in all its glory. Drenched in light both from the double height ceilings and huge sparkling chandeliers, each wall is covered in a mixture of antique mirrors, painted panels, beautiful bay windows and a patinated parquet floor. I fell in love right there and then and seeing it for myself in the flesh did not disappoint. As it happened the boy and I didn’t marry in Rye – for logistical reasons more than anything but I have two sisters so there’s still plenty of opportunity to have a family wedding there…hint hint. 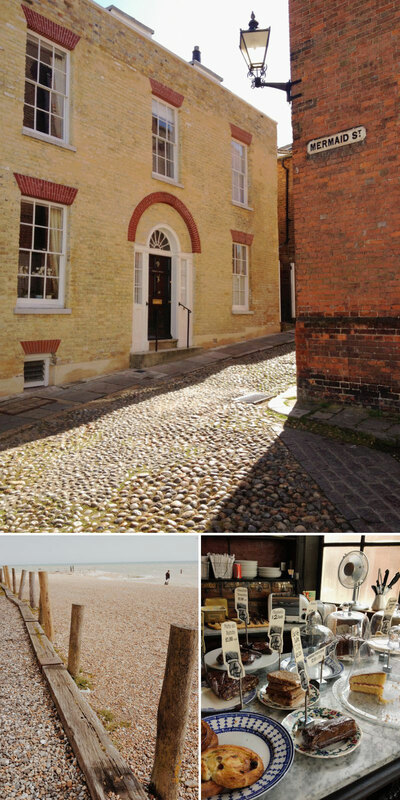 The George is a gorgeous townhouse property that sits proudly on Rye’s High Street only a short walk down the road from the Town Hall. The decor itself is a eclectic mix of antique furniture and paintings paired with more contemporary pieces. You can choose to have your civil ceremony in The Georgian Ballroom which seats up to 100 guests or marry at one of the various churches in Rye. We popped along to have a look at some of the churches which are gorgeous lovelies – particularly the one on Church Square – and so peaceful too. If you’re after something replete with history and traditional elegance then there is also the Town Hall just up the street from The George where your marriage can be announced by the resident Town Cryer when you’ve sealed the deal! We didn’t meet the town cryer but we have it on good authority that he can shout LOUD folks. After your ceremony, staff can either serve delicious canapés in the elegant surroundings of the Benson Room complete with grey bar or if the weather has decided to be kind outside in the contemporary courtyard. The Ballroom also doubles up as the most wonderful, most exquisite reception room for up to 120 guests. I mean seriously folks, you have to see it to believe it and I have to say that I’ve not yet come across the a venue that matches its innate elegance. The images here say it all. 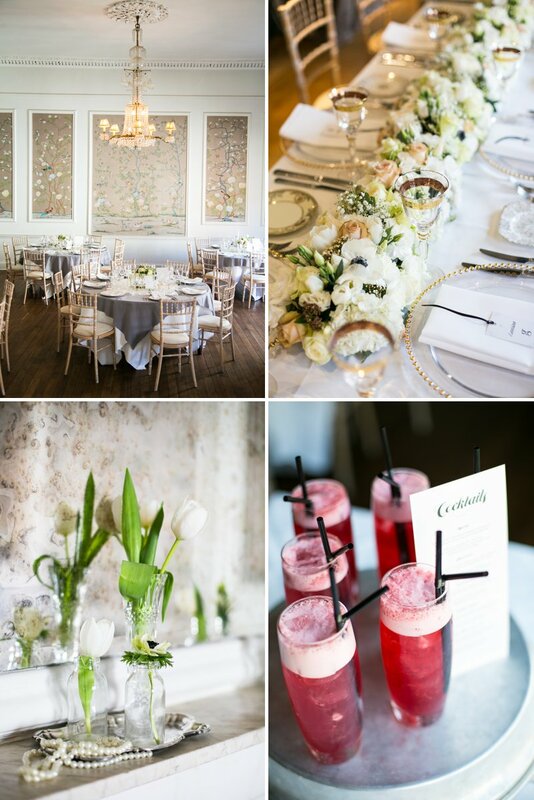 Alternatively if your wedding party is a little smaller, then the chic Benson Room is the perfect location for a more intimate wedding breakfast. Events Manager Karen also pointed out to me a sweet balcony just off the Benson Room which is the perfect spot for photographers to capture guests laughing and joking unawares. Oh to be a guest at a wedding here…. I wouldn’t say that I’m a huge foodie but I am a girl that loves my fish. And there was plenty of it on the divine menu of The George’s restaurant – The Grill – headed up by Craig Wales when we sat down to eat in the evening. All their ingredients are sourced locally with their fish and seafood picked straight off the trawlers of Rye Bay – a major plus point in my book. Even Ste who detests fish (strange boy!) was well catered for with a juicy steak and a truly immense sticky toffee pudding. And I haven’t even begun to tell you about the mean cocktails that the resident bar – The George Tap – serves up. Naturally we had to try a few…y’know to make sure it they were as delicious as we imagined. Attention to detail at The George is second to none. I mean you know that completely freeing feeling you have when you know that you are being well and truly looked after, when you know that every whim is being catered for. This is what The George excels at. Ste and I might have done a little jig around our room when we saw it for the first time. We stayed in one of the ‘Luxury’ rooms, containing possibly the hugest bed I’ve ever seen, gorgeous furniture and topped off with free-standing bath in the centre of it. Sinking into the luxurious bedlinen was like going to sleep on a cloud and the little touches such as the cashmere hot water bottle and the lavender scented pillows made my night. The lovely staff at The George will even deliver one of their gorgeous cocktails to your bathtub should you so wish – how immense is that?! Whilst we didn’t take advantage of this service, we did jump in the tub and have been fully converted to the joys of having a bath in your room. How ever shall we manage without it?! Karen showed us around each of the 34 bedrooms at The George all with their own sense of originality and style. 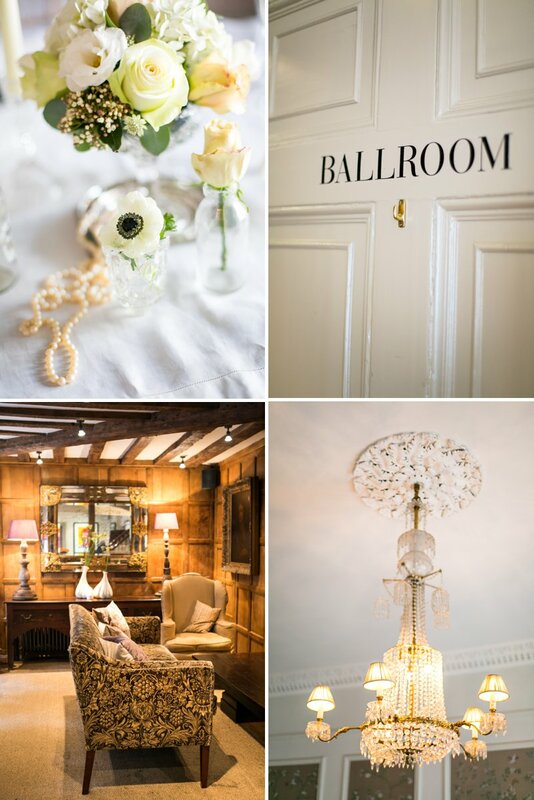 From the more traditional rooms in the original 16th Century coach house to secret suites in the rafters and more contemporary designs in the outbuildings surrounding the chic courtyard you can be sure that your guests will fall in love when they book their rooms for your big day. We were lucky enough to pay a visit to The Rye Retreat where brides and their maids can be pampered and preened to within an inch of their life on the morning of their big day. Only a hop, skip and a jump away from The George the boy and I made this our first port of call when we arrived in Rye and it certainly set the tone for the brilliant weekend. I opted for an Elemental Nature facial to try to combat the effects of that blastedly long Winter on my skin. Essentially I was as dry as a lizard and no amount of moisturiser was shifting the dry patches on my cheeks. Forty five minutes later however, my skin was as soft as a baby’s bottom and I was on cloud nine surrounded by the subtle scent of rose petals. After a refreshing peppermint tea and a serving of lemon sorbet – trust me folks you wouldn’t think it works but those clever folks at The Rye Retreat know exactly what to tempt you with after your treatments – I was led upstairs to the salon to have my tresses tamed into a sleek and chic do. To say that I felt like a film star afterwards would be an understatement and I’m now a definite convert to Aveda products. Whilst I was being blissfully pampered, I’d left the boy in the capable hands of Ella who gave him both a Deep Cleansing Facial and a full body massage. When he finally emerged he was so relaxed and zoned out that he looked like he’d been hit by a bus. And I mean this in a totally good way. I have Ella to thank for Ste’s newfound love for facials – apparently all men should have them at least once every two months. Not sure what the bank manager is going to say about that dear. Regardless, The Rye Retreat is the perfect one-stop shop for brides and grooms alike offering everything from pre-wedding pampering to make-up and hair styling on the day itself – definitely somewhere I’d recommend you lovelies to visit! After I’d managed to prise the boy from his reveries, we decided to explore Rye and all its delights. 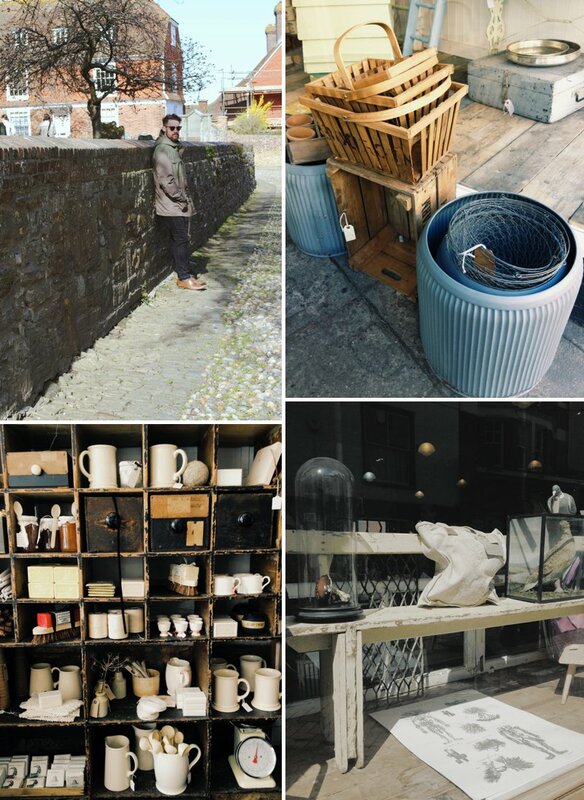 And it was there I fell in love with Pale and Interesting – the homeware store belonging to stylist Atlanta Barlett. All long scaffolding planks, filled with paraphrenalia such as cloches with skulls and twine underneath, bundles of old ribbon, tin trays filled with trinkets, whitewashed wood and huge glass vases. I swear – it was like being in Lolly heaven. I couldn’t leave without buying several mugs, various lengths of ribbon, a basket and a cloche to house my packing twine. I’ve still got my heart set on an antique ladder towel rail that the boy said I couldn’t have because it wouldn’t fit in the car going home. 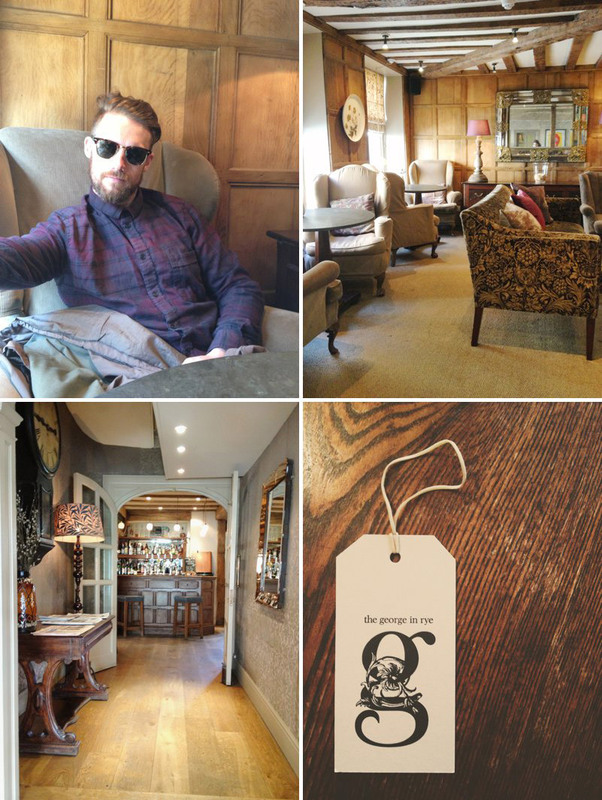 He soon changed his tune when we popped into Merchant and Mills where he decided that the car was roomier than we first thought just so he could fit some amazing finds from this draper’s paradise. For those of you not familiar with Merchant and Mills think of a ultra masculine version of a haberdashery and you’ll get the idea. And for those of you obsessed with type, it’s definitely worth checking the packaging out. If you’re a coffee and cake fanatic then it’s worth visiting The Apothecary next time you’re in Rye. Once an… yes you guessed it folks… Apothecary, this sweet building now functions as a coffee shop filled with gold leaf labelled small drawers, large phials of coloured water and the hugest counter I’ve ever seen. Mr Collins also says to let you know that the coffee and walnut cake is superb! At the risk of having our faces sandblasted off by the sand and sudden gale force winds at Camber Sands, we decided to abort a gentle stroll along the sea in favour of a trip to nearby Hastings instead. If you love antique boutiques and junk shop finds then you’ll love Hastings because it has hundreds of them…and then some more to boot. It’s Hastings Old Town that has the pick of the bunch in my opinion particularly George Street which is home to everything from quirky bars, bicycle stores to amazing interiors shops. Two of my favourite boutiques were Butler’s Emporium – a treasure trove of knick knacks, old pieces of antique furniture, haberdashery paraphernalia and glitzy trinkets – and Warp and Weft – a tiny shop filled to the brim with quality and timeless vintage clothes and interiors. I may have indulged in a metallic bag or five from Butler’s that I couldn’t resist at the bargain price of £2 a piece and which double up as the perfect make-up bag. The boy meanwhile had his heart set on a pair of brogues from Warp & Weft whilst I eyed up some oyster and blush coloured vintage slips hanging at the back of the shop. In the end we left, without the brogues and the slips and with slighty heavy hearts at doing so, but blissfully relaxed nonetheless. You can contact special events manager Karen on 01797 222114 for wedding and event enquiries and of course have a butchers at The George In Rye’s website for further details. Are you thinking of hosting your big day near the sea? If so where? Perhaps you’ve attended a wedding at The George and followed the town cryer through the streets…if so what was it like? As always leave us your thoughts in the comments box below lovelies. P.S A Big thanks to Gabi from Simply Blue PR for organising such a beautiful getaway and to Karen – the wonderful Events Manager at The George who made sure that we were very well looked after.